Gender-neutral with room to grow, these modern nurseries are a fresh take on your little one’s first room. Designing a nursery space for a new baby or growing child can be intimidating. The only things changing faster than your child’s shoe size are their tastes. How can you keep up with your child’s developing sense of self and still have a space that both you and your child enjoy? There’s no need to worry. 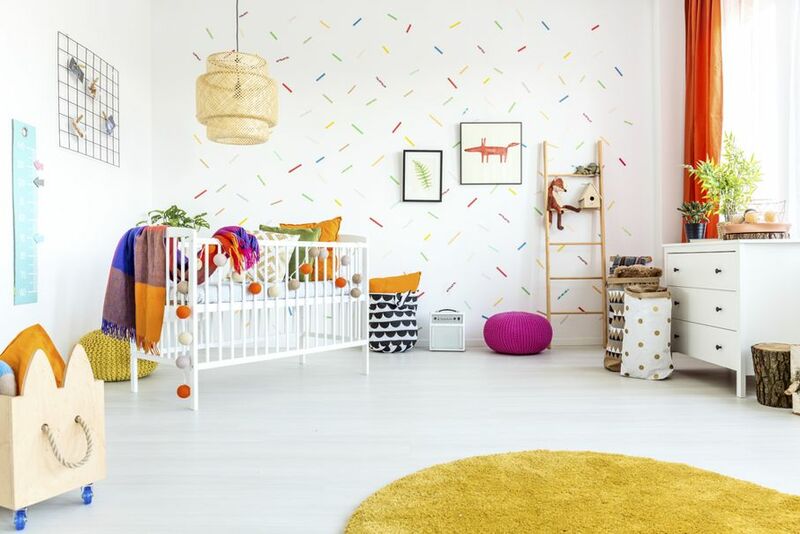 Gender-neutral and free of trendy licensed characters, these six interior decorating plans for modern nurseries offer a fresh take on your little one’s special space. Sweet without being overtly feminine, the black and white décor elements of this room plan are complemented by the scenic wall decals portraying mountains and sky. The angular, simplified styles of the landscapes and soothing muted pastels make for a pleasing combination that stimulates your child’s imagination without being overstimulating. Although seen here with a child’s bed, this style can easily accommodate a crib for infancy but shows room to grow with your little one. This room design for a young child incorporates a desk area that can be used for homework, play time and creative projects. 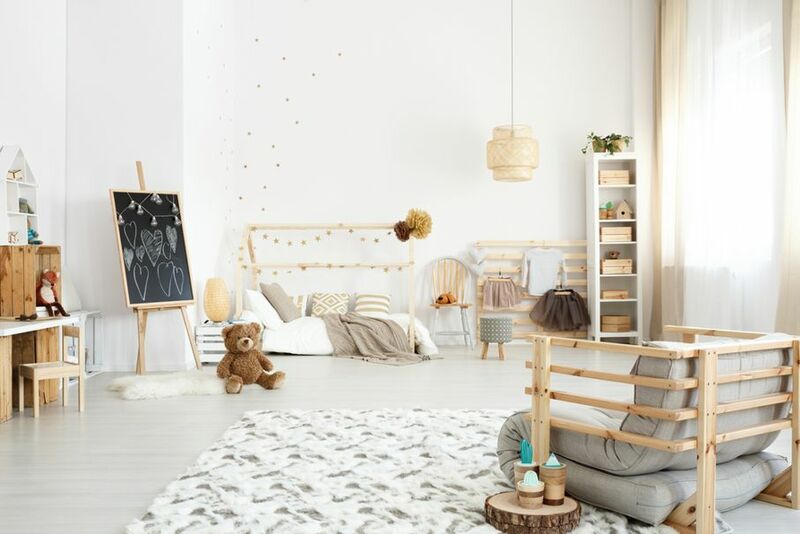 Natural wood accents add warmth to the monochrome color scheme, allowing your inner interior decorator to play with a variety of texture and pattern in black and white throughout the space, and allowing your child’s creativity and expression to flourish without constraint. This bedroom design idea, clearly inspired by an urban architectural aesthetic, brings a metropolitan appeal to your child’s room. Both the headboard and 3D room décor incorporate city buildings, and the theme continues in the play area with architecturally-themed toys and a play rug that depicts an urban road map. 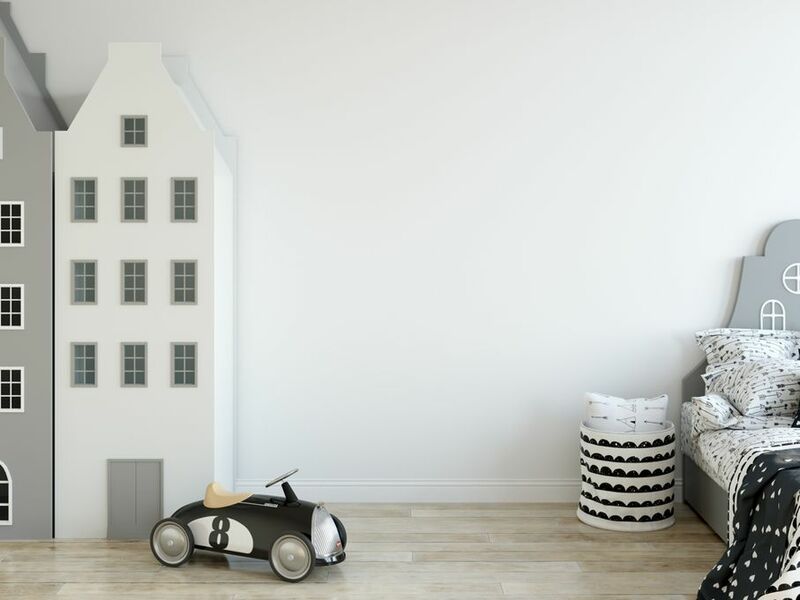 The black, white and grey color scheme looks great as a monotone interior design idea or easily accommodates a bright accent color of your child’s choice. Just because space is infinite doesn’t mean it can’t be cozy too! This space-themed bedroom décor idea is perfect for a little boy or girl who dreams of space exploration. 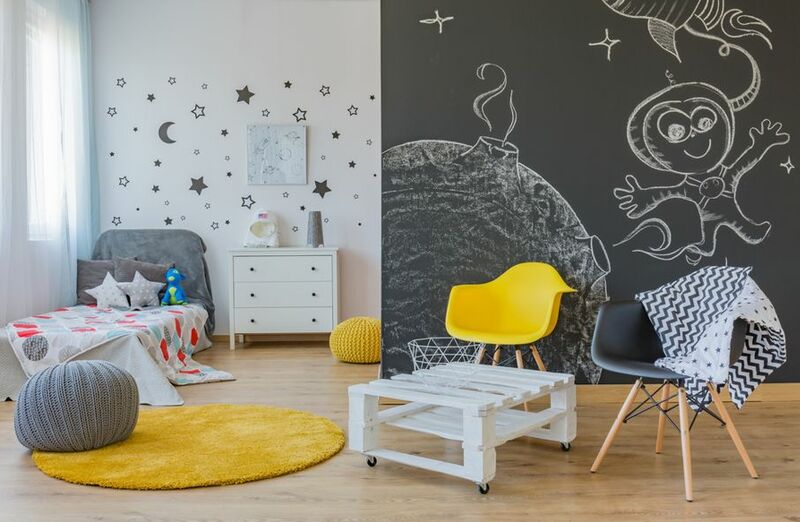 A chalkboard wall will inspire their imagination and allow them to chart routes to new planets, while ample seating provides mom or dad a place to sit and read stories of far-off space travel. This eclectic interior decorating theme avoids sensory overload for both you and baby by offsetting splashes of color with natural wood accents against a white backdrop. The multicolor wall treatments are confined to one accent wall, creating interest and balancing the mix and match the color scheme of the various décor accents. This bedroom plan is great because it allows freedom and flexibility when choosing toys, furniture and décor accents as your child grows and tastes change. This spacious child’s room layout is soothing and chic enough that mom and dad will want to hang out there too. Raw wood accents do double duty as decorative storage solutions for your child’s clothing, toys and art supplies. The plain décor is infused with bohemian style thanks to accent décor like plants, tree-inspired furniture and copious amounts of fur to keep things cozy. These natural elements add warmth to what would otherwise be a stark white backdrop. Whether you have a baby on the way or are looking for an interior décor refresh for your little bundle of joy, these ideas offer plenty of design inspiration for your child’s space. No matter which style you favor, these options give your interior decorating, and your little one, plenty of room to play and grow. Happy decorating!